Rickenbacker 4003 Stereo Bass Guitar, Natural Walnut Finish Easily one of the most recognisable bass guitars on the planet, the Rickenbacker.. 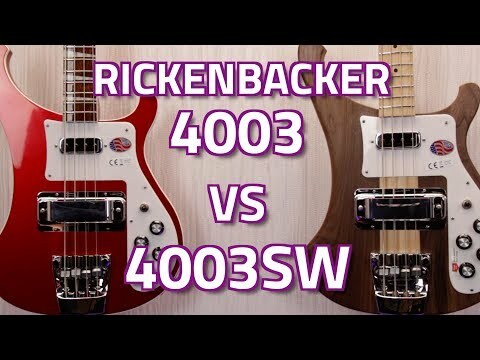 Easily one of the most recognisable bass guitars on the planet, the Rickenbacker 4003 has been regularly used by many true musical icons over the past five decades. With bassists such as Lemmy, Mike Rutherford, Mani (Stone Roses) and more besides choosing the Rickenbacker 4003 as their bass of choice, it's no wonder the instrument remains so popular to this day. The basic tone of the 4003 is extremely well-balanced, providing you with a solid midrange and a touch of high-mid honk with a nice, fast attack. This sound is easily tamed with the use of either of the two tone controls though. With the bridge pickup you have the louder of the two, with a throaty, almost-but-not-quite harsh bark that can easily be softened through use of the tone control. In contrast to this, neck pickup focuses on plenty of warmth and fundamentals, producing a pleasing array of woody tones. The overall shape and construction of this bass has barely changed since it's first inception in 1979, even down to the extensive chrome hardware use. Anyone familiar with the basses of this era will instantly recognise the chrome pickup shield over the bridge position, and the unique scratchplate shape. Having played one of these myself, I can honestly say it feels like holding a piece of rock and roll history in your hands. Contact your local PMT store or our Online Sales team if you have any questions regarding the availability of this incredible bass guitar - and don't worry if it's not currently showing up in stock, as we can still place a special order for you. Order yours online today and don't forget to choose from our fantastic range of Home Delivery and Store Pickup options!